Keynote: Energy and enthusiasm, grounding of purpose and re-vitalising. Chakra: First - Root or Base Chakra. A gentler effect of the more potent P3 Deep Red Pomander. 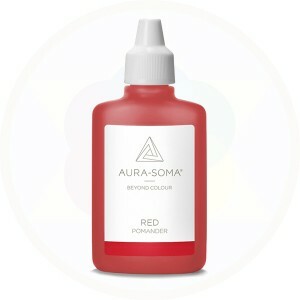 Red has all of the energizing and protective properties of the Deep Red, and is suited for everyday situations, whereas Deep Red is for more extreme situations. Red helps to overcome the negative effects from disappointment, resentment and animosity, either toward oneself or others. It can help to overcome shyness in someone who has difficulty showing physical affection to those they care for.